Here is an extract of an interview with Fonterra CEO, Theo Spierings, published in China Daily. As the biggest dairy producer in the world, what's your role in China? We're the biggest producer in terms of liters. We have indeed collected about 25 billion liters of milk this year. We have an integrated strategy in China, which means we supply China from different milk pools in the world. What are your competitive advantages over other international and Chinese brands? From different milk pools in the world, and our Chinese farms, we provide safe nutrition to consumers and we control end-to-end. We really control from the cows. In New Zealand, we have our own farmers, so we control it from farmers to consumers. Compared with the farms in New Zealand, what's the difference with farms in China? They produce the same quality milk. We run global food safety and quality standards. In New Zealand, we have a different climate, so our cows can be outdoors 12 months a year. They eat fresh grass and they are in the open air. In China, we have a feed law system. The cows are inside in bars, and we feed them certain diets and nutrition, which is more like the American system. Do you plan to add to your R&D efforts in China? We should consider it, because China is such an important market. We will make more efforts in research, product development and applications, and we are looking for more partnership in China as well. If a company wants to develop new products and apply them to consumer markets, it needs to be in big markets like China. How confident are you about the Chinese market? I see huge opportunities in China and trends are favorable for us. There are big trends in the baby food sector, following the new second-child policy. There will also be strong growth from the middle class, and then there's a large aging group who need safe protein and dairy products. Besides, China is the biggest e-commerce market in the world, and it is growing extremely fast, as people have money and they want convenience. Just to launch products alone on e-commerce platforms is not good enough. We need to create social media, easy payment systems and fast delivery solutions. Do you mainly target middle-to-high income consumers? At this point of time, yes. We are more in the higher-tier cities. But with our partnership with Beingmate, for example, we specifically target 3rd－4th－tier cities. I believe that with rural e-commerce solutions, there are massive opportunities, as not many foreign brands really reach China's rural areas. In those areas, there is purchasing power, but there's no strong offerings of products. Do you have any plans for new investments in China in the next few years? We have not stopped investing, even if though the growth might be slowing down. We will continue to invest in brands, our farms, and expand our food services business. Besides, we invest a lot in people. We have around 1,500 staff employed in China. Do milk products popular in Asia have any flavor difference with those in Western markets? In Asian markets, people tend to like sweet flavors. But in China especially, mums don't like to see their children consuming sweet products, so that trend is actually declining. Most of the markets in Asia are used to cooked milk, because of limited refrigeration solutions, so the fresh products and chilled products are always small in Asia (but it's driving up fast now). Why did you join Fonterra? Fonterra is a cooperative. We have extremely good farmers with very good farming systems. What I also see in Fonterra is that it has strong brands. It presents products in around 140 countries in the ingredient business, and we have opportunities to invest in many value-added products. We have a very strong and still growing milk base, and we are able to expand it to all the regions to collect milk. It's a big challenge to be the largest dairy nutrition provider to consumers in the world: the challenge of making a difference to the lives of 2 billion people. What's your greatest achievement in your career at Fonterra? We wrote a very compelling strategy in the first three months when I arrived in the company. We moved the company from being four divisions to one company with one strategy. We are trying to make the most revenue from every liter of milk in markets where we operate. Alongside that, we re-organized our capital structure and launched an IPO. The innovation and the execution of the strategy is my greatest achievement. What's your management style like? I'm a storyteller. I'm very strict and focus on strategy. If things are not in line with the strategy, I can be very black-and-white. But there are choices. I'm trying to tell people why we are doing things and why not. Sometimes people think they have a good idea, but it doesn't fit to the strategy. Once we've made our choices, I give a lot of freedom to the staff to execute them, and we share stories on the journey to execution. I talk to people and really appreciate what they have done. Have you been to any Chinese cities? What's your favorite one? My favorite city is Chengdu. I like the heritage and beauty there. My first time in China was in 1995, 20 years ago. When I come to China, I only focus on where we operate. Traveling in China would be nice, but I need to have a little more time. How do you break ice with Chinese businessmen? I've met a lot of Chinese businessmen. We need to work very hard because Chinese people do. In the Chinese context, if one is not seen to be working very hard or making full energy to make it happen, then he or she would be seen as failing, in my opinion. Chinese like good ideas and people with good knowledge. And we need to go fast. In China, people go fast. I don't have a weekend. I'm based in Auckland now. If I ever have time, I like sailing and doing sports, such as swimming and going to the gym in my free hours. He mentions brands a fair bit. Do Fonterra have any brands in China. Sure they have names on boxes, but any brands, really? They may have been a bit late to that party. Why is Fonterra producing milk in China...?? I'm not sure that he answered this...?? As a Cooperative it seems counter-intuitive that it should invest in and produce milk in China..?? How does that maximize NZ Farmers profits..?? There would need to be a compelling reason.... and he has not really given any in this interview..?? Maybe it is to compensate for the extreme seasonal flow of NZ milk ..?? I'd also suggest that a consumer might perceive a difference between pasture fed milk and in a "cage" grain fed milk.... and that gives a point of difference in regards to Branding and marketing..?? Have to say.... I don't find his "stories" that compelling.... but, then again, I'm a city boy... not a farmer. As a yardstick... I'd say that if Fonterra had the leading brand of Baby milk powder , in China, then it might be doing alot of things right......???? Does it have the leading Brand there..?? There is a lot more to the investment in China thing than Theo lets on here. 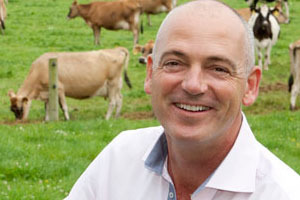 I attended a talk by Fonterras head of Dairy development, Phillip Turner and it was a real eye opener. Basically he was saying that Fonterra is required to invest in China or else China will stop allowing Fonterra access to their markets. Effectively the whole free trade agreement with China is not worth the paper it is written on as Fonterra is having to spend a lot of money to maintain access to the Chinese market. Fonterra is now applying the same principals throughout Asia in an effort to open up access to other markets, their latest investments are in Sri Lanka where they have given access to NZ technology and farming methods to Sri Lankan farmers in return for trade access. I came away with the opinion that other countries don't actually want our milk much if they are putting so many barriers in Fonterras path, and maybe Fonterra is not a sustainable business model as it stands as a mass producer of commodities in a very flooded market where potential customers have so much choice of where to source dairy products now. Don't know how media have managed to blame dairy farming for Havelock North's water problems. Are there any dairy farms in the area? Mainly horticultue and vineyards. Can't let a propoganda opportunity go to waste every time a council messes up. I think if you head up stream up the ngaurongo whatever you call it river there is dairying under irrigation. And again up the next valley north of there. Puketitri?? Here an interesting story about it which examines whether contaminated river water has entered the aquifer due to very dry weather. It goes on to blame farmers but also says the town sewerage got flushed into the river during a recent storm.